An amazing illuminated and framed image of your ride! The ride has never been so real! "Light Your Ride!" is an exclusive product from PhantomBiker -- a stunning presentation of your bike and your ride up Mt. Washington! Brilliant translucent film of your image is mounted in a custom-made wooden frame, protected by UV plexiglas and backlit with adjustable intensity LED lighting. The excitement of the ride, the depth of the background and the details of the bike are all vividly displayed with "Light Your Ride!" from PhantomBiker! Note: the depth of the frame allows it to be placed on a shelf and be self-supporting (no mounting is necessary). Alternatively, the frame may be hung as a standard picture frame. This product is new for 2018 and has very limited availability: only 25 "Light Your Ride!" orders will be accepted in 2018. Order soon! "Relive the Ride!" -- day and night -- with the exclusive "Light Your Ride!" from PhantomBiker! Each "Light Your Ride!" 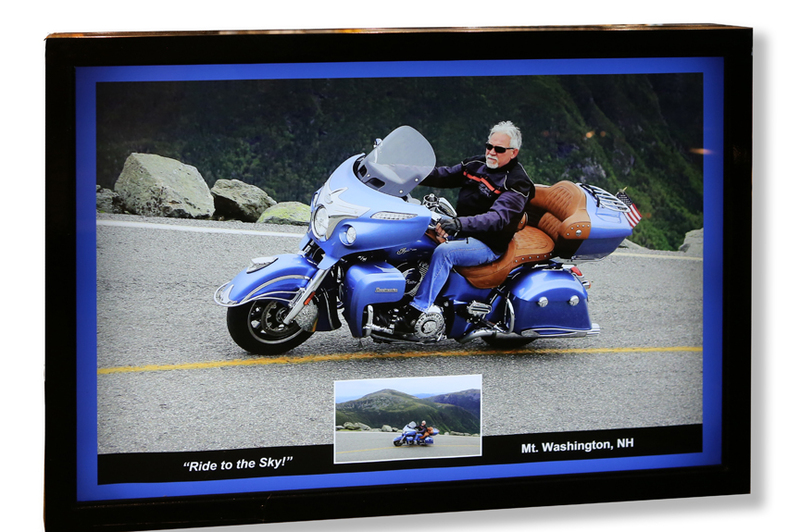 framed is unique with its own custom designed image and border, hand-made frame and individually assembled LED board. Frame is subject to slight trim changes and may exhibit nominal variations in finish and fit. Optional Accessories for "Light Your Ride!" If the frame is located more than 5' from a power outlet we recommend a power supply extension cord. One end of the extension connects to the end of the 5' power supply cord and the other end connects to the rear of the frame. Available in 6' and 12' lengths. 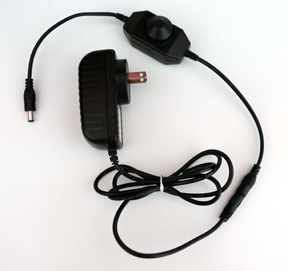 The manual controller may be located on either end of the LED Extension Cord. 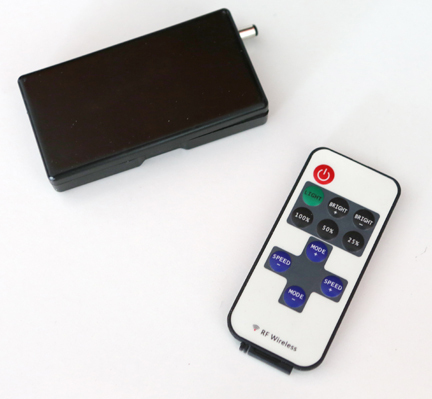 Click here for a placement diagram of the manual controller, the remote control and the LED extension cord. "The 'Light Your Ride!' backlit image illustrates the bike and the beautiful Presidential Range in the background. Thank you!" "I have the 'Light Your Ride!' in my garage and it's wired so when the garage lights come on the image lights up. It's great!" "I purchased a framed print from PhantomBiker when I rode up the mountain a couple of years ago but the 'Light Your Ride!' is really special. I'm planning on buying another bike next year so I may purchase a second 'Light Your Ride!'"